ORIX Theater, Osaka, Japan 10th April 2014. 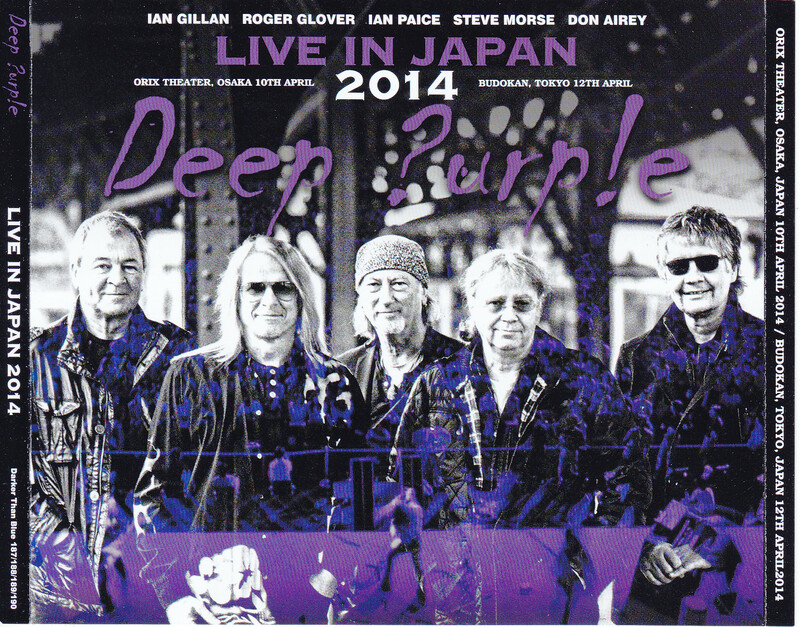 2014 Japan tour of DEEP PURPLE to tighten alive and well know of “Legend” to hard rock fans of Japan, took place within a very popular. The choice that carved the pattern in the last day in Tokyo and the second day and Osaka of all three performances, finally appeared in the press fully qualified as a 4 CD set! The direct use in two shows both, between traders and not known at all, even on the net, the original master recording ‘s offer of course. Ease of listening performance that does not lose to the official, the sense of reality of raw official not to be able to taste, in the sound of the best, you can enjoy it without the very best! Of 1994 after the withdrawal of Ritchie Blackmore, Steve Morse since officially joined the band 20 years have passed since already. Richie existence absolute for the fans. Its successor or severe in how heavy responsibility, and if you look at the Tommy Bolin of the fourth quarter PURPLE, you will place where everyone understands. But (That said there is one cushion that one o’clock participation of Joe Satriani) observed in both the band and fans, Steve, has established a position as the enduring cornerstone of PURPLE now. 2014 Japan tour that took place in milestone 20 years just from the Steve subscription has left a strong impression on many fans. Starting with the Nagoya performances April 9, and Osaka and Tokyo, live great excitement both. Enthusiastic performance of the band does not lose its hard appearance well reaching the frontier of maturity even more than, 2014 to live implementation in the Nippon Budokan to be about 18 years, and official shooting in the same performance, visit to Japan of the big names is one after another I did what you SAID ALSO the year spring, and Special. How WAS the show, IS known to fans More Fan by multiple Items already. If it IS a strange Recording does not the Press of, WAS Released the Other Day at a Gift title Above all “MADE IN Budokan “was surprised the fan. But the sound source excellent simply because they have been around for more than one, the fans what you want to the collection” definitive edition “.” That orange jacket “3 title as is the case in the 2014 Japan Sound of THE ROLLING STONES, Item called “all right if I put this in hand” IS IS what IS needed. And meet the expectations of everyone of Those fans More Fan, Came to Japan in 2014 Sound source of DEEP PURPLE ALSO Appeared Definitive Edition here! Both press on CD from the original master of the full first appearance, and Osaka performance of April 10, the Tokyo show on the 12th, the last day in April in this work! It is a four -disc set, along with a rich sense of reality, and vacuum packed with great audience sound performance of incandescent! In the disk 1.2, and complete recording live in Osaka “ORIX theater”. Where there was this venue, Osaka Welfare Pension Hall of once. Second phase PURPLE showed their stage last, live was also performed (2009) visit to Japan last in 1973 . It IS a place of deep edge for the band. This Sound source taper Michael Schenker Osaka performance of 2014 and “BRIDGE THE GAP IN OSAKA”, VAN HALEN Osaka performance of 2013, SUCH as “A DEFINITIVE KIND OF OSAKA”, HAS left the name Recording of many in the Kansai region of the current due. It Will Satisfy fans More Fan all this time, we Have a pattern of Containment Live Audience Sound miraculous. On this Day, taper things Went in the Recording position of the Fourth row from the stage. Rich feeling of air sound easy to hear, and powerful sound that pop out from the left and right sides of the channel, which is backed by a clearness of outstanding, just like a live venue exactly. Moreover, good balance and a sense of separation that you can hear (exaggeration of anything! Without) in units of one sound to the base notes of Roger Glover is a splendor that can not help reckoned even official Though it is audience recording! Both great and “Smoke On The Water” hot “Black Night” solemn some clarity “Contact Lost”, “Perfect Strangers”, even while the harmonious! It would be like you enjoy, a recording that you can assert that best take of the moment in “NOW WHAT ? !” Tour ! In the disk and 3.4, complete recording of it (not to mention, another master of the gift is a “MADE IN BUDOKAN”) Tokyo, Nippon Budokan concert April 12. Osaka performance was also stage at important places for the band, but the “weight” is also different from the Nippon Budokan. Also they who left the legend of many, “LIVE IN JAPAN” will go through someone’s mind inevitably Speaking live. It is not funny even if it becomes “This is the end” in Given the Age of the members FURTHER. Air of trying to experience the “Legend” up to the younger Generation from the mania of veteran HAD minagi ~ tsu at the venue. Position of the taper in this Recording (seems to Have Been a vacant SEAT Two seats on the right side, according to the taper) sixth column A2 block. Captured in direct without being blocked also who the sound output from the speakers hanging left, equipment is compatible with allocation ideal the ease of the best listening and powerful, and the sense of reality of the best. Compared with Osaka Take WAS Characterized by Symmetry That dignity and spread wide even drifting, this Recording IS to Focus FURTHER into the Musical tone of the Stage, (Compared to listen to the performance in Osaka Take IS Interesting! ) In response to listen to the sound board the same level as most musical tone. It seems the more vocal of Ian Gillan and guitar of Steve Morse and “? There any sound source in a matrix”, and has realized the sound realistic on. You will be able to realize the good of this vivid recording music again hard and “Into The Fire” and “Hard Lovin ‘Man”, the playability of the band such as “Lazy”. In that it depicts the Katsuaki the guitar playing of steve IS Likely thought of as a Sound source, to Commemorate the “20th Anniversary of PURPLE join his” Described Above. (There IS a feature from Day to Day IS Interplay and solo of course) WAS Done in the set list of the Same both days to live. 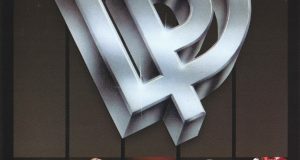 Than there is a surprise (Jon Lord appeared on the last day at this time), such as a visit to Japan in 2009 among some fans? It was said, but the set had followed the overseas performance of just before. But things simply because it is regular set, threatening him as “PURPLE current progressive form” that travel. Rhythm section of Roger Glover and Ian Paice unfolds Guillain made ​​to hear the relaxed vocal powerful the previous visit to Japan or more, Steve Morse unfolds the Play of the best Part in Our full-length Live, Play an aggressive just like the Heyday … Play … hot air like Spewing from the Whole band Will Knock out your hand to listen! This Contact form INSTEAD of posting or kicked off dramatically intro and “Mars” new song in “Apres Vous”, masterpiece of the “IN ROCK” hard “Into The Fire,” “Hard Lovin ‘Man” with the barrage, air venue I will be hot at a stretch . Resulting in a pleasant mood “Strange Kind Of Woman” is a harmonious addition, it is crazy to live the fan! New song from “Vincent Price” and “Uncommon Man,” “Above And Beyond”, I give off the presence of the only one not “stand of his predecessor ‘s” Don Ailey and Steve further. Served with a flower each song sound colorful or sparkling Biya, emotional guitar polite to quick Steve will groan hands after hearing Don. If you listen and “Contact Lost “and” The Well-Dressed Guitar “(this is play say as a matter of fact, to be absolutely perfect as a guitar player) you will be able to understand what amazing how as guitarist Steve! I will not explode the drum solo that Transcends Age in “The Mule” Pace ALSO Outdone! Listening place IS ALSO Jostling Live the Second Half. Fun-filled Play of members Each person IS Glowing from “Lazy”, new Song to Boil the hall to catchy and a strange Combination of the “Hell To Pay”. I will be thrilled, even “promise you” flow to the “Perfect Strangers” solo from Don. Climax of the performance, the audience of the band peaked “Space Truckin ‘” and later, I will not complete combustion and “Smoke On The Water” encore of the “Hush”, “Black Night”! It should be noted that even if the fan dry, 2014 visit to Japan last day an admission enthusiastic performance of the band. Young fan to understand the reason is “legend” of the band, mania veteran I think in was fascinated by the performance of intimacy that does not change now. I Cascia in poetry raw and bare, the truth of “Legend live in the present” that in this work! Official live work if coming out after this, audience recording to increase its significance even more. This work can assert that the highest peak among them, is the rock fans must listen all definitely. There is only this work if enjoy the Live in Japan 2014 model year. So that you do not miss, the CD4 -Disc Complete Limited Press a must must listen! 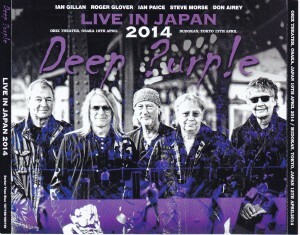 Tighten known alive and well in the “Legend” in hard rock fans of Japan, DEEP PURPLE in 2014 Japan tour that took place in one of the popular. All three definitive edition that engraved the second day, Osaka and last day & Patterns in Tokyo of the performances, finally appeared in four sets of fully qualified press CD! Of course in two shows both, not known at all, even on the net and between traders, and direct use of the recording’s provision of the original master. The raw realism that does not taste the official, the official in the performance of listening ease that does not lose, in the best of sound, can enjoy without your very best! 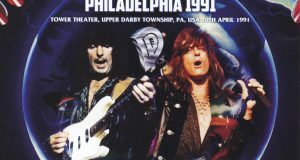 1994 after the withdrawal Ritchie Blackmore, from Steve Morse has officially joined the band, trying already passed since 20 years. Richie is absolute existence for the fans. Its successor is how things tough in the heavy responsibility, and if you look at the Tommy Bolin of the fourth stage PURPLE, it will place that everyone will understand. But Steve, (That said there was a one cushion that one o’clock participation of Joe Satriani) observed in both the fan and the band, we have now established the enduring position as the cornerstone of PURPLE. 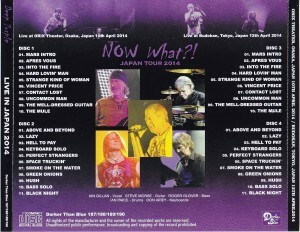 2014 Japan tour, which just took place in ’20 of the milestone from the Steve subscription has left a strong impression on many fans. Starting with the Nagoya performances April 9, and the Osaka and Tokyo, live any great upsurge. Even more than the enthusiastic performance of the band that does not lose even hard of reaching the maturity of the frontier, to live implementation in Nippon Budokan to be about 18 years, such as the official shooting in the same concert, there were numerous visit to Japan of big name 2014 also the year the spring, it was what it can be said that special. Appearance of live has been already known to fans by more than one item. “MADE IN BUDOKAN” which was released in among them the other day gift title, and is a strange record not pressed reduction, was surprised fan. But precisely because they excellent sound source has been around for more, the fans what you want to collection the “definitive edition”. As in the 2014 Japan sound of THE ROLLING STONES is the case is that “orange jacket” 3 title, I items of “okay If you put this into the hand” is sought. In response to your expectations of such a fan, is the definitive edition appeared here also in 2014 Japan sound source of DEEP PURPLE! Osaka performances and, the Tokyo performances of the last day, April 12, any press on CD from the full first appearance of the original master of April 10 in this work! The performance of incandescent along with the rich sense of realism, this 4-Disc, which was vacuum packed with great audience sound! In the disk 1 and 2, the complete recording of the live in Osaka “ORIX theater”. It had place this venue, former Osaka Welfare Pension Hall. The 1973 second quarter PURPLE is showing off the last stage, live has been made ​​even last visit to Japan (2009). It’s the edge of the deep place for the band. This sound source years Michael Schenker and Osaka performance “BRIDGE THE GAP IN OSAKA” of 2014, such as VAN HALEN Osaka performance of 2013 “A DEFINITIVE KIND OF OSAKA”, has left many of the name recorded in the current Kansai region taper and by. It will satisfy all fans this time, we have containment the pattern of live in miraculous audience sound. Taper this day, that of and was recorded in the position of the fourth row from the stage. Preeminent easy sound image to listen backed by clearness, the powerful sound and rich air sense of pop from the left and right channels, just live venue just like. In addition to the base note of Roger Glover (without any exaggeration!) Can take listening in one sound unit separation feeling and goodness of the balance is a splendor that can not help but put a glance even the official Even though audience recording! Some clarity “Contact Lost”, the majestic “Perfect Strangers”, hot even while the harmonious “Smoke On The Water” and “Black Night” are both great! The “NOW WHAT ? !” recording that you can assert that the best take of the moment in the tour, I would like to Enjoy it! Then, in the disk 3, 4, complete recording of the Tokyo Budokan performances of April 12 and (Needless to say, the gift “MADE IN BUDOKAN” the master separate). Was a stage of an important place for Osaka performances also band, Budokan is still “weight” is different. Also they who left the numerous legendary, inevitably “LIVE IN JAPAN” is crosses the head Speaking live. It is not funny even further to “This is the last” Given the age of the members. Air that tries to experience a “legend” up to the young generation from the veteran of mania had Minagi~tsu at the venue. Position of the taper in this recording A2 block 6 column (yes 2-seat right beside According to taper was vacant). Equipment is captured in without direct it, which is also blocked by the anything the sound output from the left side hanging speakers, we have both the best sense of realism and powerful, and the ease of listening of the best in the ideal distribution. And compared to the wide breadth and elegance proportioned that even drifting was characterized Osaka take, this recording is further focus to the musical tone of the stage, the musical tone is almost hear the sound board par meet (Osaka listening than interesting with performances take!) . Steve Morse’s guitar and Ian Gillan of vocal enough to seem “Do not a matrix sound source?”, And has realized the realistic sound image in on. “Into The Fire” and “Hard Lovin ‘Man,” such as hard music, such as once again show off playability of the band “Lazy” would be able to feel the goodness of this recording. In terms are drawn to Katsuaki the guitar playing of Steve, is likely to say the sound source to commemorate his “PURPLE join 20th anniversary” earlier, also. Live it was performed in the same set list on both days (of course solo and Inter play is characterized by the day). 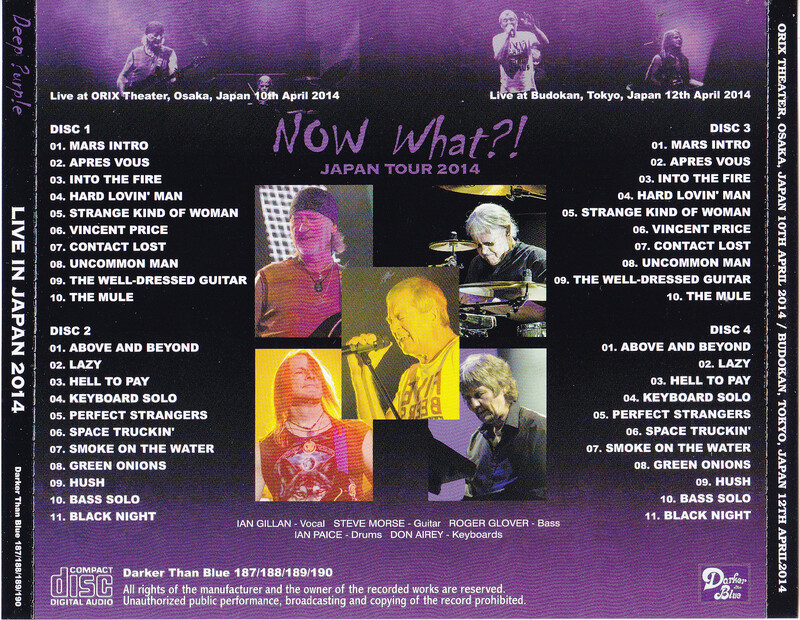 Than there is a surprise (Jon Lord appeared at this time last day) some among fans, such as the 2009 visit to Japan? But was told, the set had been followed the overseas performance of the previous. But precisely because regular set, “of ongoing PURPLE” as that terrible travels of. Guillain you to listen to the powerful and relaxed vocal than previous visit to Japan, Steve Morse unfolds a spectacular play in the live of the whole volume, rhythm section of Ian Paice and Roger Glover unfolds the aggressive play of the heyday just like … hot air spewing out such a play from the whole band … will knock out a hand to listen! If you think that the dramatically or ushered in intro “Mars” and new song “Apres Vous”, hard “Into The Fire” from the masterpiece “IN ROCK”, “Hard Lovin ‘Man” 2 in the barrage, the venue of the air I will at once hot the. In addition, “Strange Kind Of Woman” is brought fun mood a relaxed and let the crazy fans to live! Further from the new song “Vincent Price” “Uncommon Man,” “Above And Beyond”, I unleash the presence of only one not Steve and Don Airey is “predecessor of understudy”. Don served with a flower to each song in colorful sound or glitter Biya, is polite and emotional guitar to quick of Steve will wow your hands to listen. If you listen to “Contact Lost” and “The Well-Dressed Guitar”, Steve is would be how great or understood as a guitarist (have any, is the play said that the full integrity as a guitar player)! Pace also let Flip and explode a drum solo that transcends the age in “The Mule” losing! Live the second half listening stations jostling. Members from the “Lazy” that each person of the play is incandescent, new song to alight the hall to the strangely catchy combination of “Hell To Pay” is fun-filled. Flow from the Don solo to “Perfect Strangers” I will be thrilled even “promise”. “Space Truckin ‘” and later reached climax of the play, the audience of the band to the peak, it will be completely burned in the “Smoke On The Water” and the encore “Hush”, “Black Night”! Even if the dry fan should be noted that the visit to Japan last day in 2014, which recognized the impassioned performance of the band. Young fan to understand the reason why is a “legend” of the band, veteran of mania or will that was not fascinated by the performance of intimacy that does not change even now. The truth of the “living today Legend” in this work, I will Cascia in the truth of vivid! If you are officially live work after this comes out, even more audience recording to increase its significance. This work can assert that the highest peak among them, all of rock fans must listen definitely. There is only this work if enjoy the 2014 type of Live in Japan. Must-have must listen a fully qualified press CD4 Disc, as there is no miss please! ★ only the first 100 sheets, will be release in with numbering into sticker.